An ace campaign operative comes out of retirement to investigate a chilling disappearance. There are few jobs that Harvey Longmire hasn't had. He's been a crime reporter, Louisiana state legislator, foreign correspondent, and - briefly - a decoy for the CIA. But he made his name as campaign trail fixer, an expert in the art of exploiting an enemy's secrets. For nearly a decade, Harvey was the sharpest man in the Beltway, but he quit in 1972, trading political dirty work for a quiet life on a farm. Now two old friends want him back in the game. A millionaire named Vullo has started a foundation to investigate conspiracies, and Harvey happens to be the expert on the most prominent case: the infamous disappearance of a man named Arch Mix. The trail is not as cold as Harvey thought. Soon he'll either find Mix - or suffer a disappearance of his own. Review quote. "Ross Thomas is without peer in American suspense." - Los Angeles Times. "What Elmore Leonard does for crime in the streets, Ross Thomas does for crime in the suites." - The Village Voice. "Ross Thomas is that rare phenomenon, a writer of suspense whose novels can be read with pleasure more than once." - Eric Ambler, author of The Mask of Dimitrios. Biographical note. The winner of the inaugural Gumshoe Lifetime Achievement Award, Ross Thomas (1926-1995) was a prolific author whose political thrillers drew praise for their blend of wit and suspense. Born in Oklahoma City, Thomas grew up during the Great Depression, and served in the Philippines during World War II. After the war, he worked as a foreign correspondent, public relations official, and political strategist before publishing his first novel, "The Cold War Swap" (1967), based on his experience working in Bonn, Germany. The novel was a hit, winning Thomas as an Edgar Award for Best First Novel and establishing the characters Mac McCorkle and Mike Padillo. Thomas followed it up with three more novels about McCorkle and Padillo, the last of which was published in 1990. He wrote nearly a book a year for twenty-five years, occasionally under the pen name Oliver Bleeck, and won the Edgar Award for Best Novel with "Briarpatch" (1984). Thomas died of lung cancer in California in 1995, a year after publishing his final novel, "Ah, Treachery!" An ace campaign operative comes out of retirement to investigate a chilling disappearance. There are few jobs that Harvey Longmire hasn’t had. He’s been a crime reporter, Louisiana state legislator, foreign correspondent, and - briefly - a decoy for the CIA. But he made his name as campaign trail fixer, an expert in the art of exploiting an enemy’s secrets. For nearly a decade, Harvey was the sharpest man in the Beltway, but he quit in 1972, trading political dirty work for a quiet life on a farm. Now two old friends want him back in the game. A millionaire named Vullo has started a foundation to investigate conspiracies, and Harvey happens to be the expert on the most prominent case: the infamous disappearance of a man named Arch Mix. The trail is not as cold as Harvey thought. Soon he’ll either find Mix - or suffer a disappearance of his own. 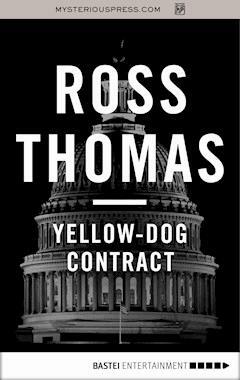 “Ross Thomas is without peer in American suspense.” - Los Angeles Times. THE PROPER VILLAIN slowed them down. I heard the car when it turned in and I could tell it was going far too fast, but I didn’t look around because I was up in the tree fixing the swing. The tree was the huge old cottonwood, probably fifty feet high, that grew on the other side of the house next to the pond. The swing was a long single length of three-quarter-inch manila rope and to its other end I had already wired a gunny sack stuffed with rags and an old army blanket. The idea was to swing off the porch rail out over the pond, let go of the gunnysack, and drop into the deepest part of the pond with a fine, cool splash. I looked around after they ran over The Proper Villain, or rather his grave. There had been the usual harsh clatter and clank followed by the screech of rubber bruising itself against metal. If it had been going five miles per hour faster, the car might have broken a shock absorber or two and maybe even an axle. But that was what The Proper Villain’s grave was for—to make cars slow down so that they wouldn’t run over our five dogs, eight cats, two goats, six ducks, and a pair of the meanest peacocks in three states and probably the District of Columbia. When alive The Proper Villain had been a nine-year-old yellow tomcat, alley born and bred somewhere in the freak haven that then lay just east of Dupont Circle in Washington. I had found him late one night in the alley back of the Sulgrave Club on Massachusetts Avenue. I had almost stepped on him and he had spit at me and swatted at my ankle, and the girl I was with, a Londoner from around Maida Vale, or maybe it was Paddington, had giggled and said, “Now there’s a proper villain, in’t he?” At the time he was six weeks old. Maybe seven. The Proper Villain lived five years in the carriage house in Washington and four more on the farm near Harpers Ferry before the Sears service truck flattened him on the quarter-mile dirt lane that led from the road to the house. It was the last time I ever bought anything from Sears. I buried him on the spot, in the middle of the lane, and to mark his grave I built a bump out of rocks, dirt, and some old railroad ties that I found in Charles Town. The bump was a deceptively rounded ridge that stretched across the lane, but if you went over it at more than ten miles per hour, you were in for some front-end work. Later, still mildly obsessed, I built twenty more of the bumps about fifty feet apart and put up signs reading “Five Miles Per Hour—This Means You” and “Posted—No Hunting” and “Keep Out—Trespassers Will Be Prosecuted” and “Beware of Vicious Dogs.” Nobody ever paid any attention to the signs, of course, but they all slowed down to a crawl after they ran over The Proper Villain.